The one-year anniversary of the first debut of the RideTech 48-Hour Corvette is only a month away. 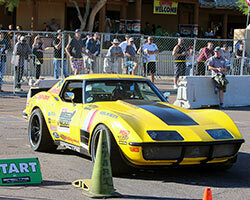 The eBay purchased car began its transformation as a bone stock red 1972 Chevrolet C3 Corvette. On March 10, 2015 the car pulled into the RideTech facility to begin a massive transformation over a mere 48-hour period from factory stock into a street legal, track ready beast. 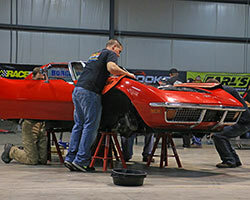 Fans of the original 48-Hour Camaro build were able to tune-in online and watch live as the Spectre Performance equipped 48-Hour Corvette was torn and put back together with the latest upgrades as well as a new color scheme. The build was concluded early that Friday morning with the sweet sound of the Lingenfelter LS7 motor firing for the first time. 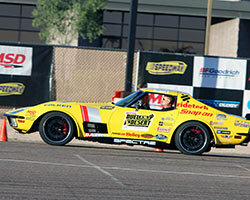 Since the completion of the build, the 48-Hour Corvette has raced all over the country including several events in the Optima Search for the Ultimate Street Car Series and the Goodguys Autocross Series. As winter approached and the 2015 season came to an end, many drivers began working on their vehicles for the upcoming 2016 race season. Chris Smith, who piloted the 48-Hour Corvette during the 2015 season, also had big plans for the car over the winter. The fenders and rear quarter panels were modified to allow for a bigger wheel & tire setup and the yellow vinyl wrap was removed. With the bodywork making progress, it was determined, after removing the wrap, that a fresh coat of paint was needed before the new season started. Once the wrap was removed the decision to strip the car of its original red color came with quite a surprise as Chris removed 9 layers of paint before he could start working on the body. Once the paint was removed and the bodywork complete, the Corvette was sent off to paint. In order to remain consistent with the yellow accents on the Corvette, such as the stitching on the seats, it was decided that the Corvette would again remain yellow for 2016. 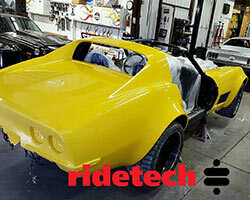 With just under thirty days before the Spectre Performance equipped RideTech 48-Hour Corvette is set to debut for its second time at the Goodguys 7th Spring Nationals in Scottsdale, Arizona, the car is in the final cut and buff stage. Reassembly will begin shortly, along with some last minute touch-ups. In addition to wider fenders and fresh paint some small under hood changes will be made before the 48-Hour Corvette’s one-year anniversary. During the original build the Lingenfelter LS7 was installed along with a custom Spectre Performance Air Intake System. Like many custom built muscle cars, the 48-Hour Corvette team needed to design a Custom Spectre Performance Air Intake to fit within the tight confines of the engine compartment. The Lingenfelter LS7 engine, making 630 HP and 570 lbs-ft torque, left little room in the engine bay for other additions or modifications. Using Spectre Performance aluminum tubes along with a Spectre High Performance Race (HPR) Filter, part number HPR9891K, the RideTech crew was able to adapt a custom air intake to the C3 Corvette’s specific setup. This also allowed the Spectre High Performance Race (HPR) Filter to be relocated away from the direct heat of the engine and radiator. Since this Corvette would be driven on the street and raced at the track, the goal was to achieve the maximum amount of horsepower. By relocating the filter, the RideTech crew was able to add additional horsepower to the already stout 630 horsepower Lingenfelter built Chevy LS7 engine. Since 1983 Spectre Performance has designed and offered unique, innovative, parts and components to fuel your car or truck obsession. Even if your fixation happens to be a classic muscle car with a modern powertrain, Spectre will help fuel your passion for performance. Browse all Spectre automotive products by category at SpectrePerformance.com. While you are there use the Products by Vehicle Search to find Spectre performance products specifically made for your vehicle. To find a Spectre dealer near you use the Spectre Dealer Locator.